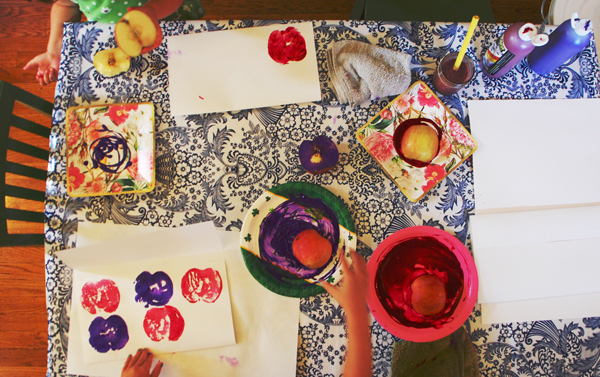 Printmaking with kids can be accessible and easy. 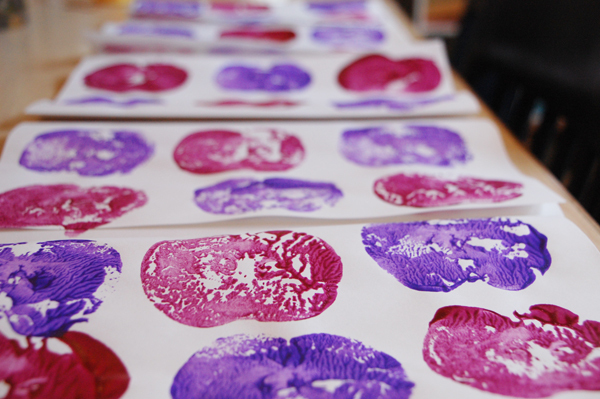 This simple printmaking activity can be set up for children as young as three, maybe even two if you’re feeling brave! I spend a lot of time at the hardware store. 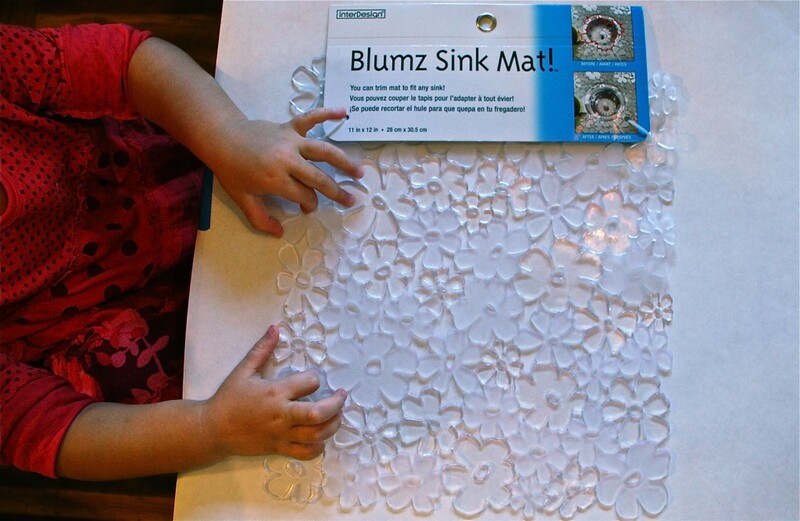 And last week I spotted this flower mat — the Blumz Sink Mat! — I love that exclamation point! — It’s an exciting sink mat! — and it looked like something that could be fun to print with! In honor of Spring’s inevitable arrival (yes, it WILL get warmer) and St. Patty’s Day (I married a “Doorley”, after all), we used green and yellow paint. I also found a bag of ten foam brushes at the dollar store, so the luck of the Irish was clearly with me. I covered the work space with paper and then my daughter painted the mat with our fresh Spring palette. And then we added a sheet of paper, pressed it down with the palms of our hands, and pulled our first print. Ooooooooh!! She loved it, and I thought it came out gorgeous! And maybe you picked up on the addition of an apron. I love that focused expression. There’s a leprechaun in my house! 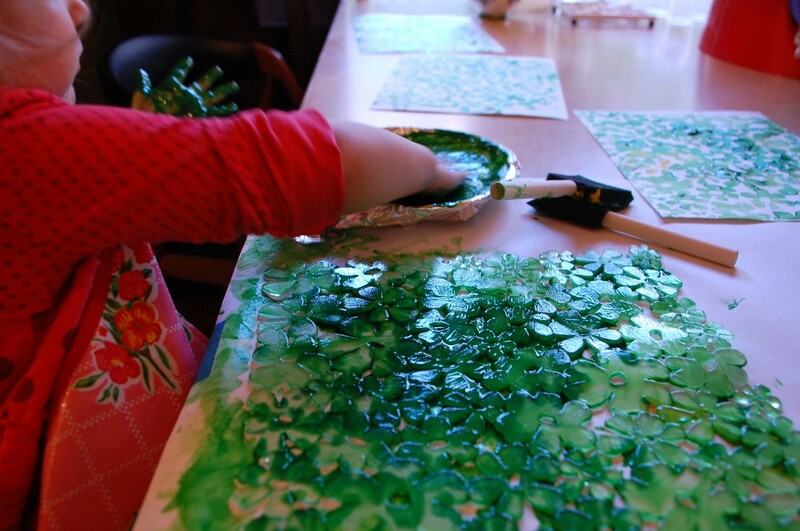 Printmaking is one of my very favorite processes to explore with children. 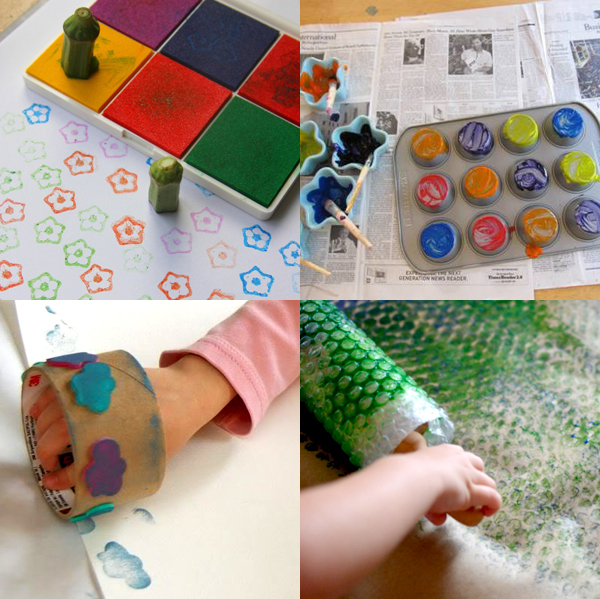 Seeing how a texture or pattern repeats itself is full of magic, and a delightful process to witness and experience with kids. 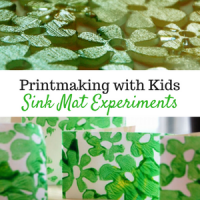 Here are 16 super easy, and very fun printmaking projects that are sure to inspire children (of all ages) to experiment with printing. 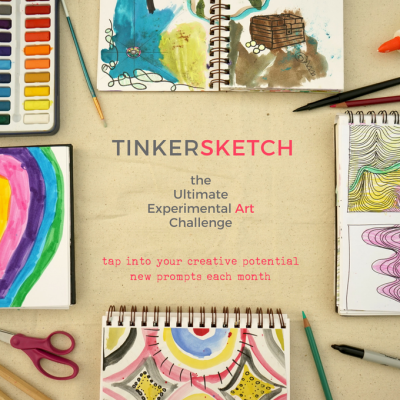 Get more ideas for raising young inventors and filling your life with creativity by signing up for the weekly TinkerLab newsletter. It’s free and we often send exclusive content and opportunities that are only available to our subscribers. 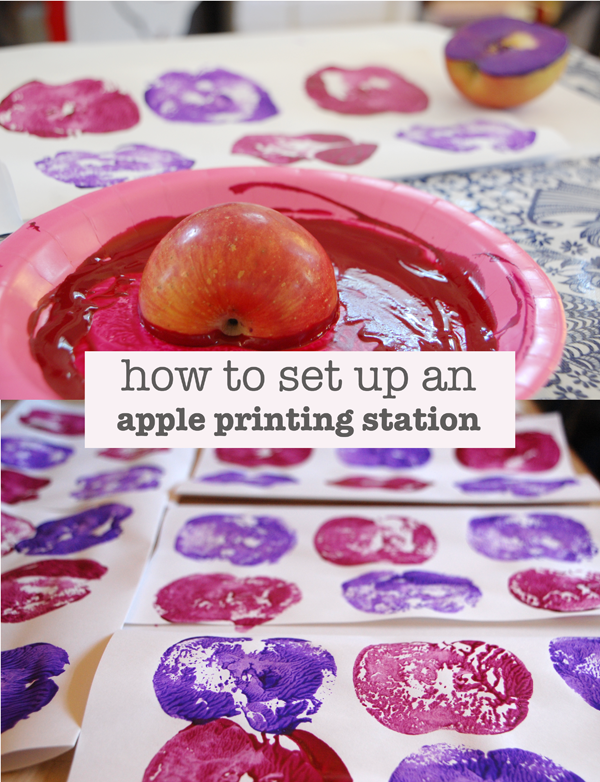 Have you tried your hand at apple printing? 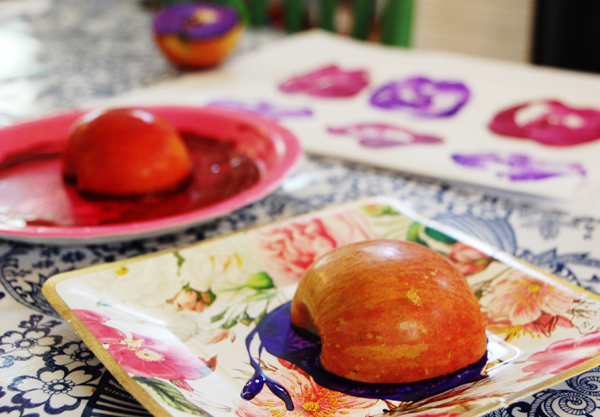 I suppose it’s a traditional Fall craft, but since apples find a way into our pantry year-round, I thought this was a fun project to share in these weeks leading up to Summer. 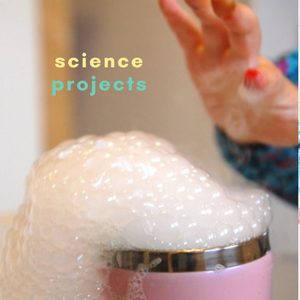 You know, when you might need something fun to keep the kids entertained during the long summer days. 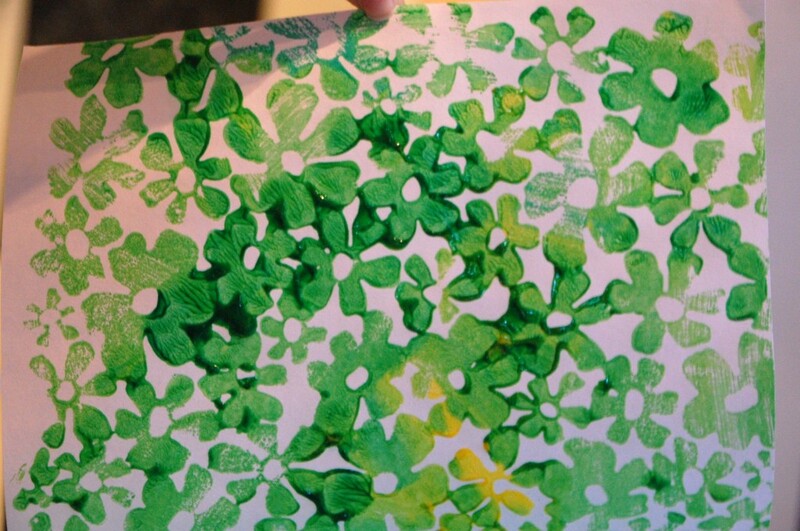 Apple Prints are an old stand-bye that my children always enjoy. 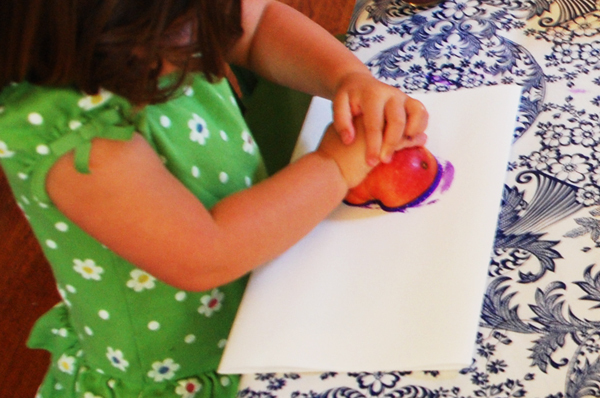 The other day, 4-year old N asked me for some paint and apples so that she could make envelopes for all of her teachers. She had another plan for filling the envelopes that involved a sprinkling of sequins and some hand-made drawings. My two-year old is always game for printing, and in a matter of minutes apple printing was in full force! If you have a precious work surface, cover it with a cloth or paper. We use brown kraft paper and oil cloth (pictured here). Have your child choose a couple colors of paint. I like to limit it to two colors to keep the whole matter simpler. 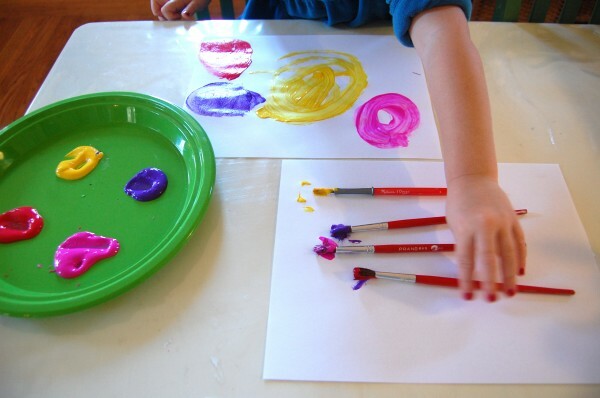 Squeeze the paint onto some paper plates. When you’re done, these can be dropped in the recycling bin. 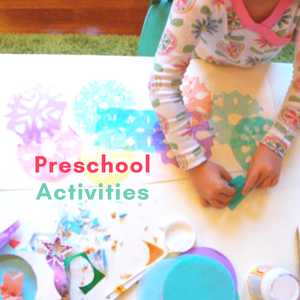 Place a big sheet of paper in front of each child. Place a damp rag next to each child. 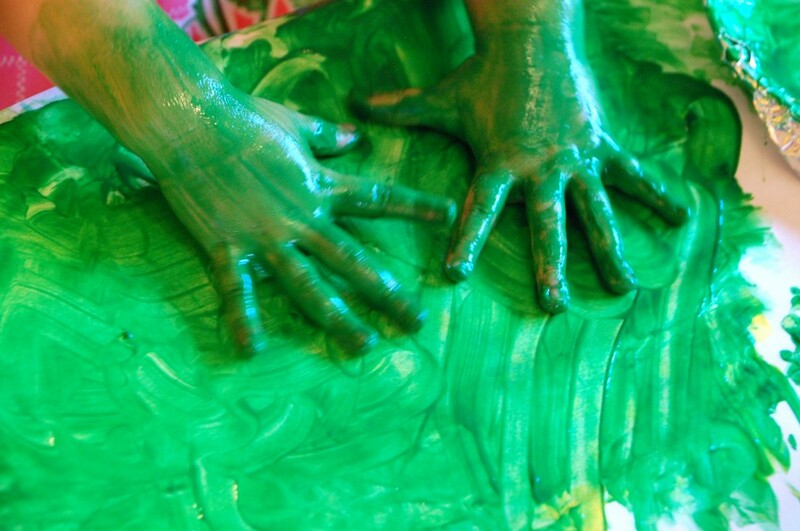 My kids always get painty fingers when we do this, and constantly get up to wash hands. The rag saves them the trip until they’re completely done. Hand each child one apple, cut into two pieces. 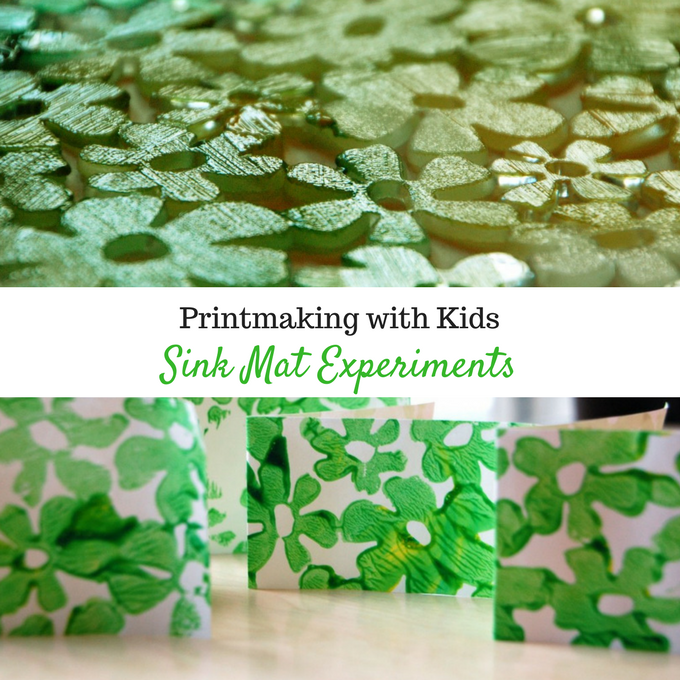 Invite your child to stamp away! Place completed prints in a drying area. 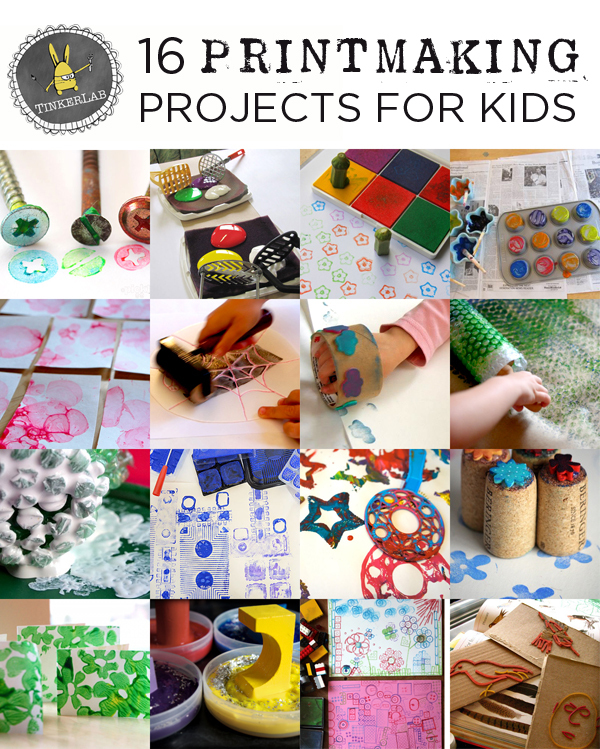 This project is great for little and big hands alike. 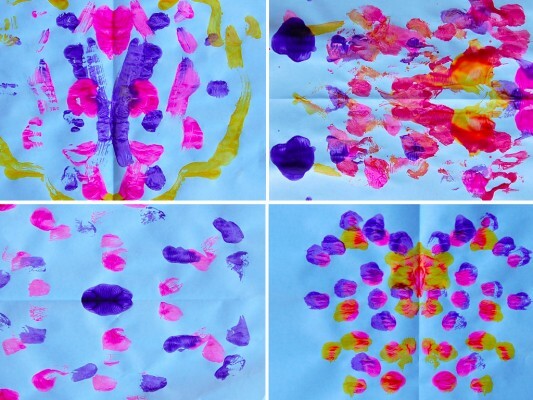 My two-year old was challenged to press the apples down hard enough to make her prints show up while my four-year old worked on creating color patterns of apple prints. 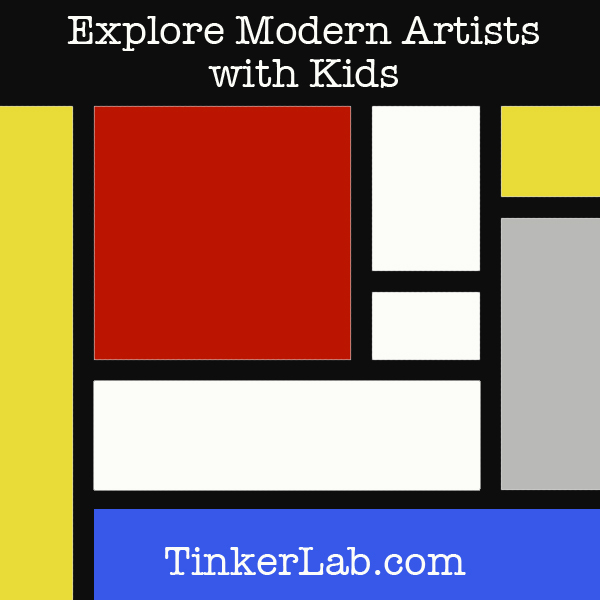 While I had to do a little bit of maintenance, such as collecting completed prints, while the kids printed, I enjoyed stepping back to allow them to experience the medium and develop independent ideas. Some people are opposed to using food as a source of art-making because it can send the message that food can be wasted. With so many people going hungry, I understand the argument for this. 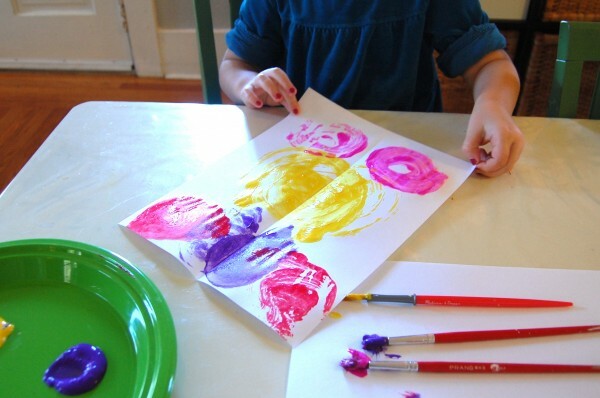 My children’s nursery school won’t use food for art-making, which is the case with many nursery schools around the world. 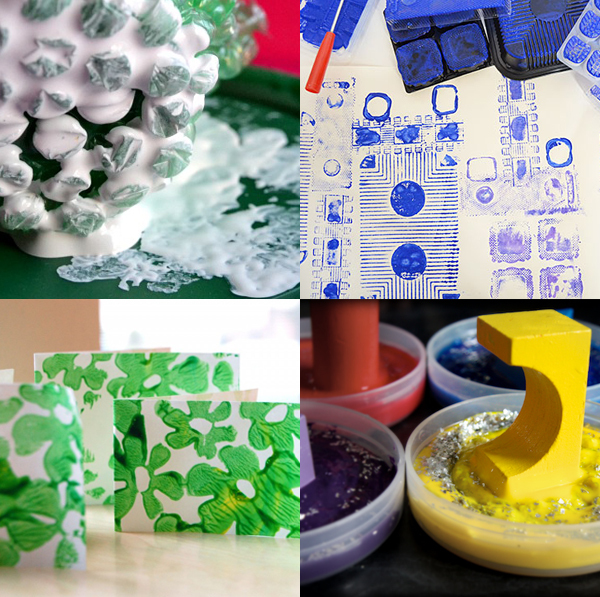 However, compared to making prints from rubber stamps which can be derived from felled trees and rubber, apples and other vegetables seem like a decent alternative. 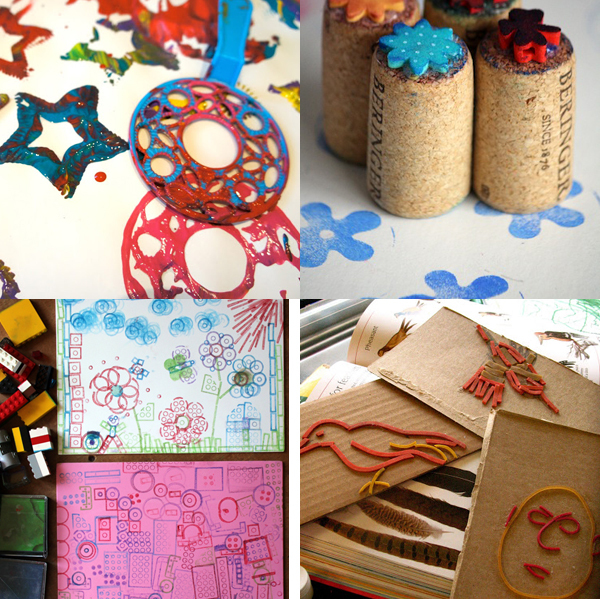 In addition, so many of our traditional art-making materials are derived from food and other naturally found products. If you have an opinion on the matter I’d love to hear your thoughts. What do you think about using food for art-making? Today we’re joined by illustrator and art educator Amanda E. Gross, who’s here to share another fun episode of Explore Modern Artists! 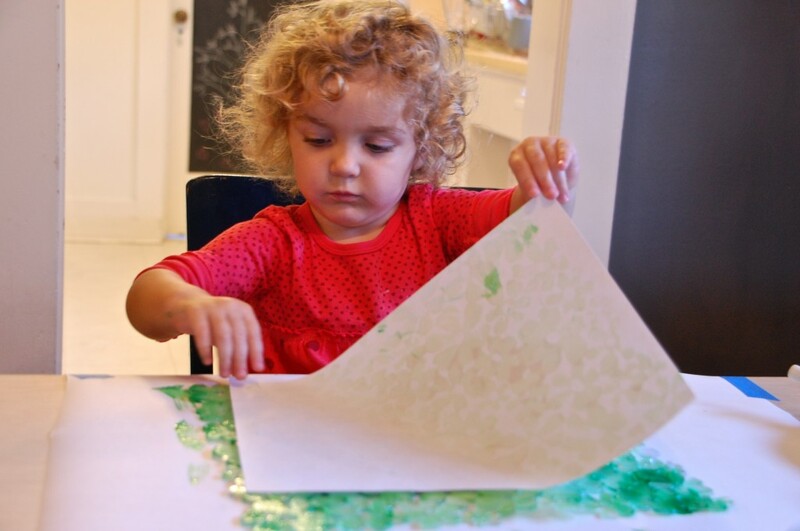 In the spirit of modern artist, Ellsworth Kelly, your child might enjoy exploring nature’s shapes to create a stencil and make a painting! 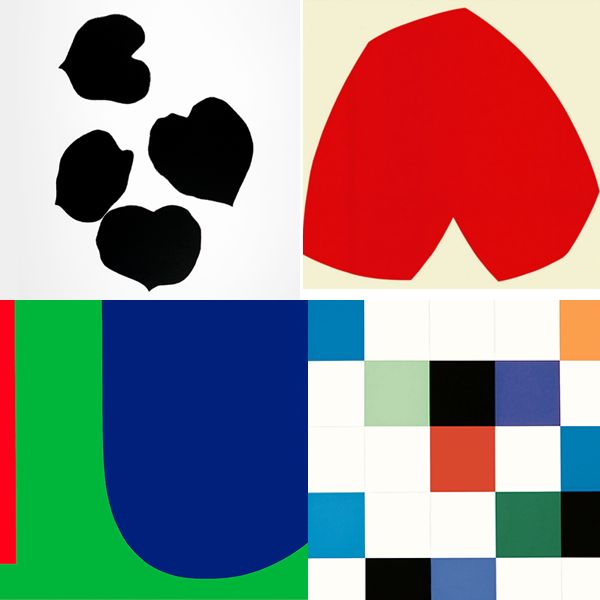 Ellsworth Kelly (1923 -) is a master print-maker. 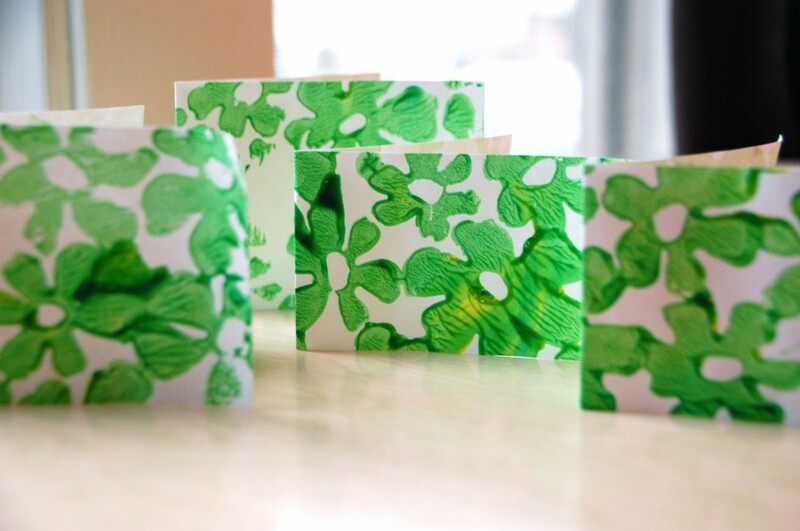 His plant drawings and screen-prints of simple shapes in brilliant hues are based on a deep reverence for nature. 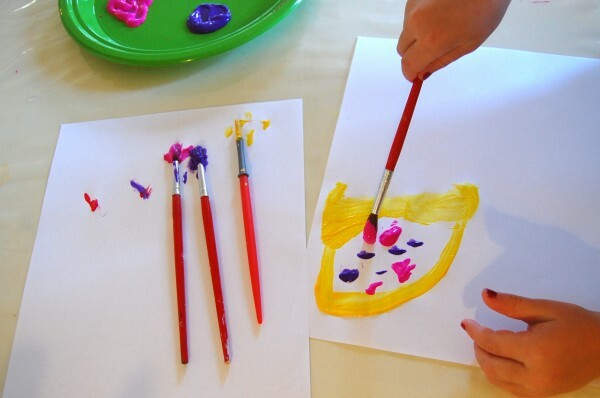 Inspired by the Kelly retrospective currently at the Madison Museum of Contemporary Art, this activity is about noticing details, abstraction, and investigating new ways of expression. Artists use elements – or ingredients – in different ways, and abstract artists use them to express how they think and feel. Do these pictures look like things in real life? Why or why not? How do they make you feel? Why? What colors / lines / shapes do you see? How do the colors make you feel? Do the colors seem different when they are right next to each other? Kelly began each image with a drawing. Set up a still life of plants or fruit, or go findflowers outside. Because this is an abstract drawing, observe what you see and pick out the basic shapes. Draw large since you will cut these out. 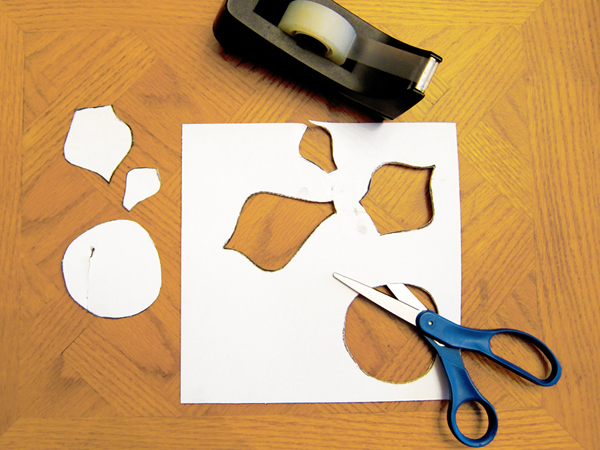 When your child is finished drawing, use scissors to cut out the shapes. If you have cuts in your stencil that you don’t need, feel free to tape them up. Put a piece of paper (or cloth) under your stencil. Choose a paint color. So that your painted shape retains the outline of the stencil, try holding it down as you paint inwards from the stencil’s edge (or, you could tape down your paper and stencil instead of holding it). 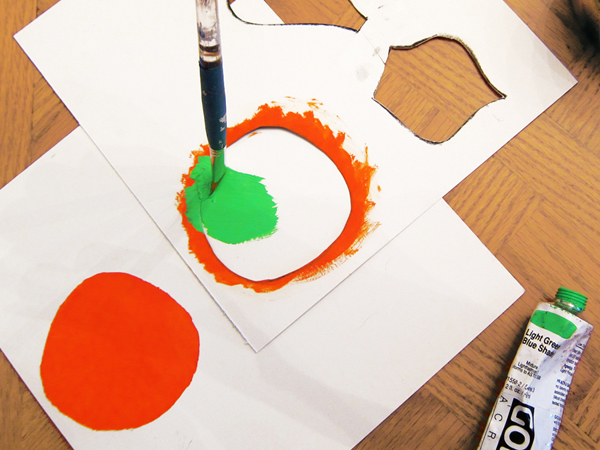 Use your imagination to experiment with how different colors act when placed next to each other, and explore making symmetrical and asymmetrical designs. 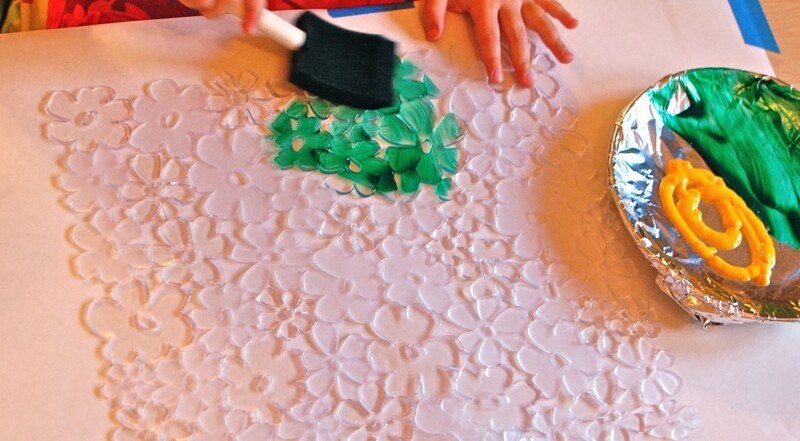 If you’d like to do the project sans water and paint, try cut-and-pasted shapes. 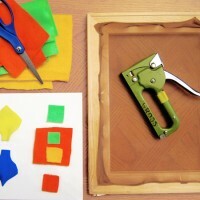 For a new challenge, try screen-printing; to construct your screen, staple a nylon stocking onto a frame. 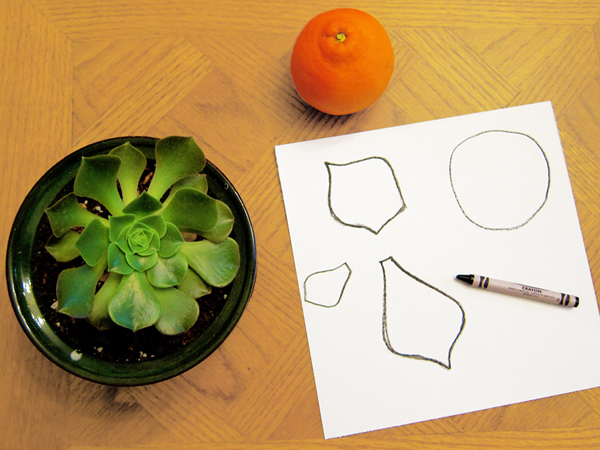 Draw your plant forms onto the back of shelf liner paper, cut out these shapes, and adhere the sticky part to your screen. (See image above) Paint! Bottom Row: Red Blue Green, 1963, 83 5/8 x 135 7/8 inches (212.4 x 345.1 cm), Oil on Canvas, Museum of Contemporary Art San Diego, gift of Dr. and Mrs. Jack M. Farris. Colors on a Grid (close-up), 1976. Screenprint and Lithograph on 350-gram Arches 88 paper, 48¼ x 48¼ inches. Edition of 46. © Ellsworth Kelly and Tyler Graphics Ltd., Bedford, New York. Collection of Jordan D. Schnitzer. 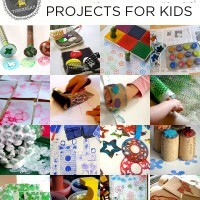 Amanda designs curricula to guide and inspire children, teens, and adults to appreciate art and to create! 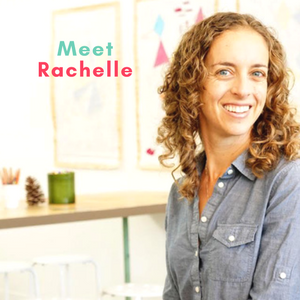 She earned a Master’s of Arts in Teaching from The Rhode Island School of Design and is an instructor at Academy of Art University. 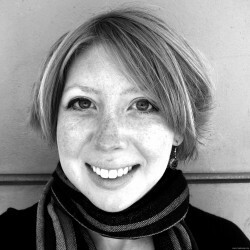 Amanda is also an illustrator, painter, DIY crafter, and permaculture enthusiast. Find out more about Amanda here: Art Curricula Website, Art Portfolio Website, LinkedIn, and Pinterest. 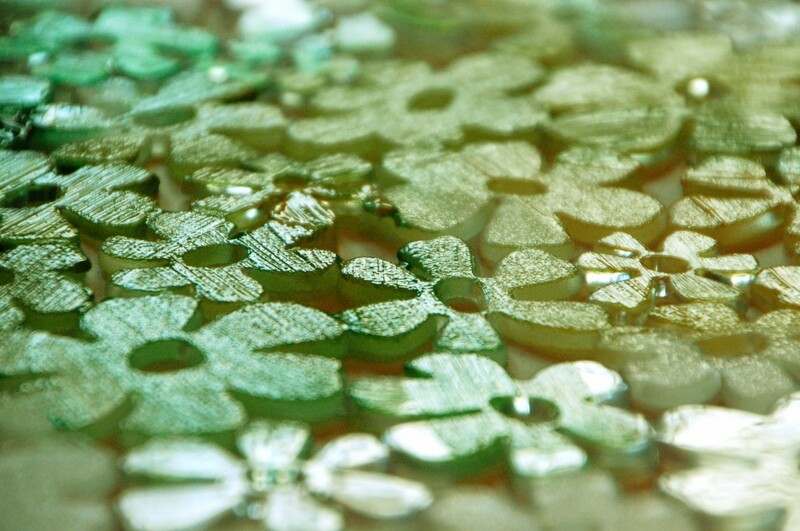 Have you ever made a stamp from a cosmetic wedge? A few weeks ago I shared this art tip about how you can salvage paper scraps that are left behind on the art table, and I invited you to let me know here and on Facebook if this was a series worth exploring. Enough of you said “yes,” that I thought I’d launch this new series and give it a whirl. 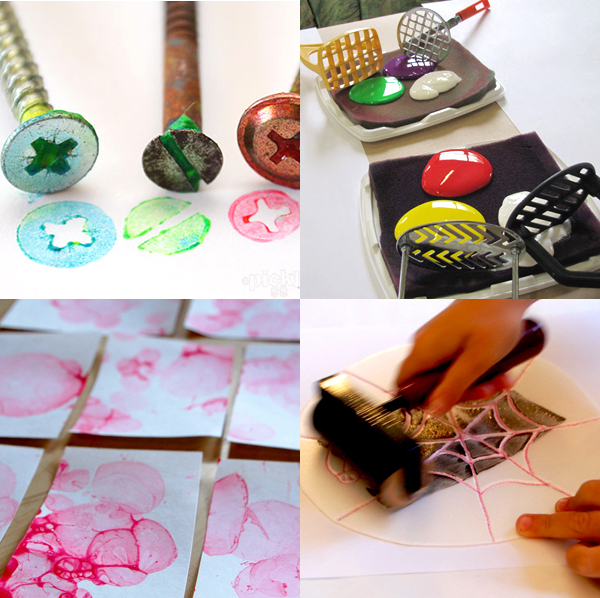 Upcycle make-up sponges into easy, homemade stamps. If you don’t have any cosmetic sponges in your home, they’re easily found in most dollar stores or the make-up aisle of the pharmacy. The wedges have a spongy texture that’s dense enough to hold ink or paint. I spotted this bag of 100 cosmetic wedges on Amazon for about $7.00, which is another option. 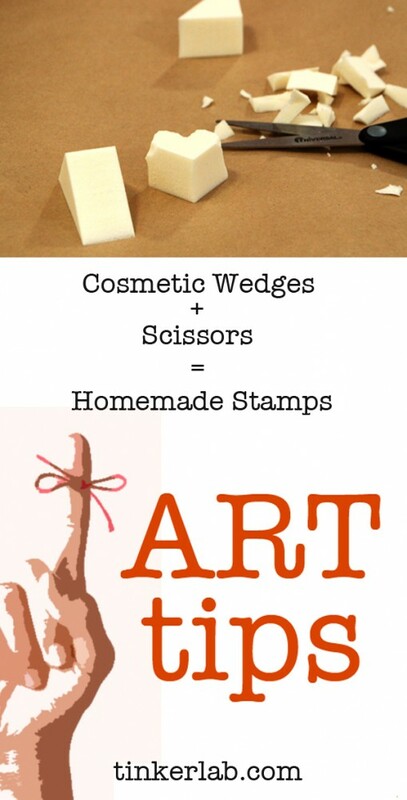 Because the wedges have a triangle shape there are only so many things you can do with them, but we found that they’re great for snipping up a heart-shaped stamp. One point of the triangle becomes the bottom of the heart, and then a few simple snips of the scissors will give you a nicely shaped heart. All of mine came out a little wobbly, but this gives them handmade character. 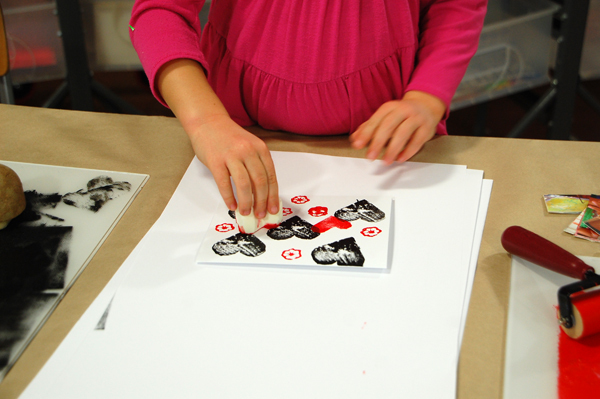 For a more archival picture or card, you can roll out some water-based printing ink like we did, but the cosmetic sponge stamps will work well dipped in a thin pool of tempera or acrylic paint. 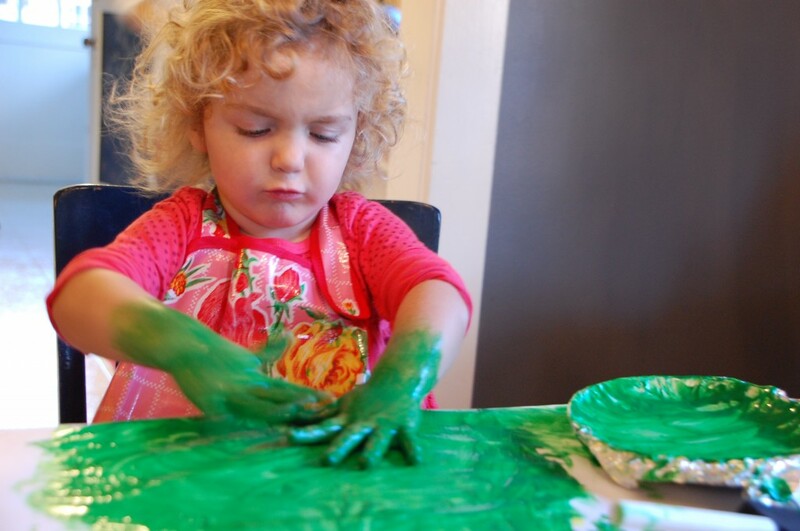 Washable tempera is more finicky, but great for messy, little hands. 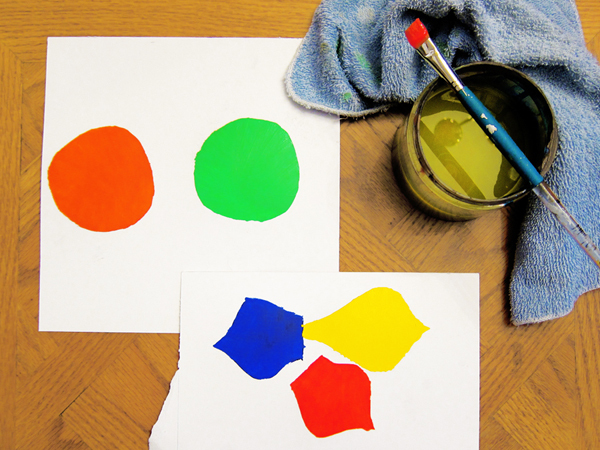 Acrylic paint isn’t washable, but it’s a good alternative to printing ink for painting on fabric or something more archival. So, do you have any cosmetic wedges that are itching to be turned into a stamp? Would you try this? Are there any areas of art-making that you wonder about or struggle with? 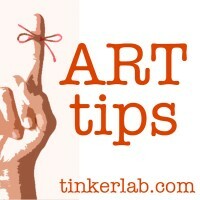 What other art tips would you like to see covered here? 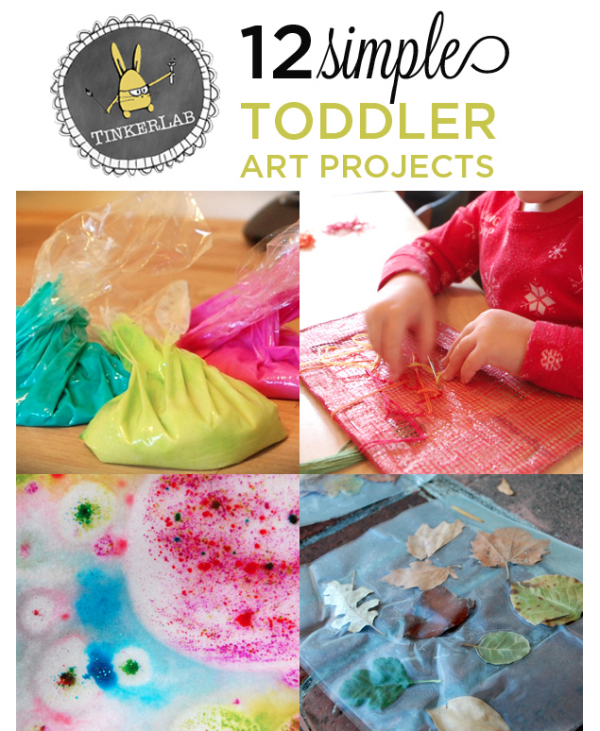 This is such a fun project for toddlers, preschoolers, and school-age kids. 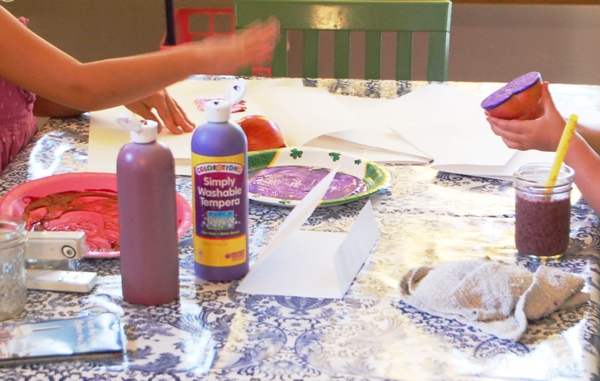 The results are always a mystery, the supplies are simple, and it teaches children basic principles of symmetry. When my 1 year old naps, my three and a half year old non-napper and I like to pull out some of our favorite messy materials that don’t normally surface when baby hot-hands is awake. The other day my older daughter wanted to paint, and we ended up making symmetrical butterfly paintings. 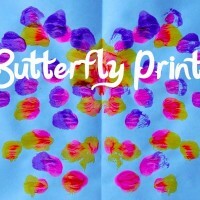 We like to call these butterfly prints, which may have some bearing on why my daughter made at least thirty of them! And I should say that I was recently asked to lead an activity at her preschool, and THIS is the project that N wants me to bring in. Not that I’m trying to sell anything, but how’s that for an endorsement? Cardstock Paper. This paper from Neenah is a good deal, and the quality is great. The set-up was really simple. 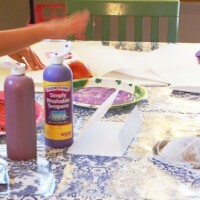 I squeezed four colors of tempera paint on a plate (I always try to limit the palette — fewer choices enable children to focus more on the process and feel less overwhelmed by materials), she picked her four favorite paint brushes (these happen to be from our watercolor sets), and I gave her a stack of white copy paper (the thin stuff). She had an extra sheet of paper to rest the dirty brushes on — her idea! 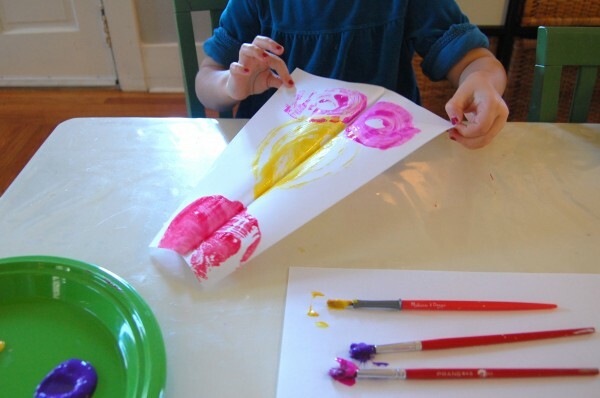 I suggested, in the most open-ended way possible, that she could paint on one half of the paper or the entire paper — it was up to her — before folding the paper in half. She had her own ideas, as kids often do, and once she made the first print she turned into a printmaking powerhouse. Crank. Crank. Crank. Ta-dah! So cute, she actually said, “WOW,” after the first print opened. Not so much the following prints, but it was clear that she loved the process. *We did this again when my older daughter was six! It’s a winner for all ages. This time around we squeezed the paint directly out of the paint tubes. 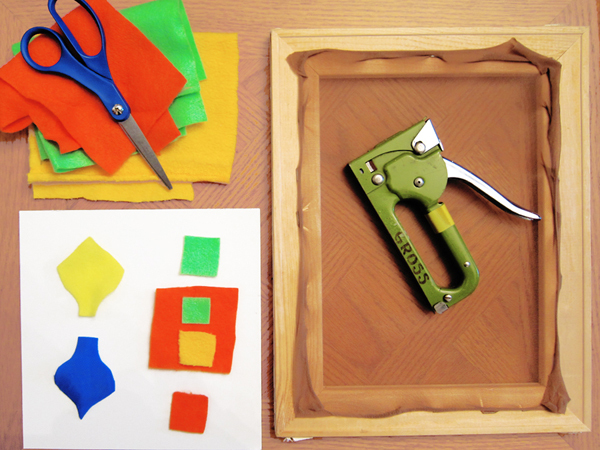 The experiments included lines, dots, overlapping colors, and even a couple diagonally-folded papers. Do you remember making these when you were a kid? I loved these, and it’s evident that it’s a timeless wonder. 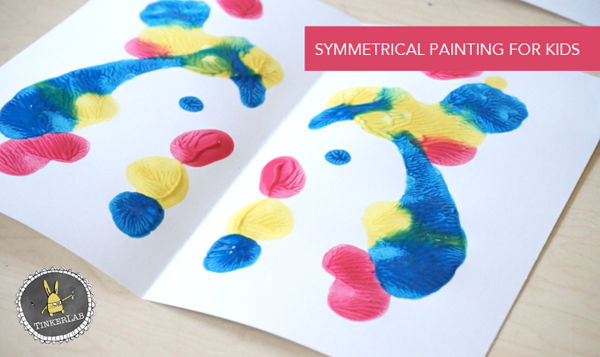 If you have or work with older children, this activity is an excellent way to introduce symmetry. For a few more related ideas, Frugal Family Fun Blog has this idea for teaching symmetry with butterflies (I always enjoy how happy Valerie’s kids are in her photos), and Mom to 2 Posh Lil Divas shares two more ways to teach symmetry with butterfies + a handful of book suggestions.